I have such fun sharing postcards, and now trade cards. Yes, I succumbed even deeper to the antique pox. 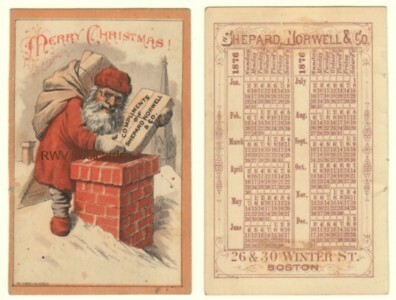 I now collect Santa and elephant trade cards as well as postcards. I thought I’d share my first acquisition. It’s an advertisement for Shepard, Norwell & Co., which was founded by John Shepard. This company was known as the greatest attraction of the narrow Winter St., in Boston, MA. It was viewed as the largest, best stocked, and most satisfactory of Boston’s dry goods houses (even over department stores). I wonder what it was like to shop at this victorian attraction. It would certainly be a trip down memory lane just to see the selection of dry goods sold then, that are obsolete now. **You can find many more wonderful victorian trade cards with great graphics, and advertising in my store. OK. Since when does a rabbit lay eggs, let alone in a nest? When one thinks about all the silly things our parents told us when we didn’t know any better, lol. We still turned out alright; didn’t we? **Many more charming Easter postcards, including rabbits, can be found in my store. I hope the Easter rabbit comes to your house and brings you and Helen each a basket of beautiful eggs. I want him to bring me a ball; one I can knock hard. We did not have any Arbor (?) Day. We don’t have things like that at our school. We just go there to play and have good times. I get E in everything, but conduct and I don’t know anymore now than I did when I was in the first grade. Something tells me this second grader isn’t a fan of second grade. Sounds like he’d rather be hitting a ball outside. This might explain why he didn’t get an E in conduct. Hopefully he didn’t spend too much time in the corner, and fared better in third grade. The lady’s scanty attire on this victorian trade card, advertising Diamond Cigars, is what caught my eye. The trade card features the burlesque and variety actress, Arline Stanley, in a romper (a one-piece garment consisting of shorts and top). This type garment was quite shocking to be seen wearing in public during the victorian era. She is also seen wearing a similar garment on a photographic card advertising Sweet Caporal Cigarettes. I can imagine Arline’s romper caught the gentlemen’s eyes, but wonder what their wives thought of them noticing. As for Diamond Cigars, it was founded by John W. Potts and a man named Eberle as the Redding Cigar Factory in 1888. It consisted of a cigar store and room behind it where the cigars were rolled. Eberle sold out to Potts sometime between the late 1880s and early 1890s. A July 1899 advertisement in the Daily Free Press read, “Smoke Smooth Diamond Cigars at the the top of the brevities”. It wasn’t until January 1901 that Potts changed the cigar’s name to “Grindstone Club”. John J. Bartosh, a cigar-maker for Potts, bought the company in July 1907. Information on this German artist has proven elusive, so my post on him will be short. Alfred Mailick was born in 1869 and died in 1946. He was an illustrator and painter of landscapes and animals who studied at the academy in Dresden, Germany. I noticed during my research, that many times his postcards included a single person (usually in native costume) with a beautifully illustrated landscape as a backdrop. 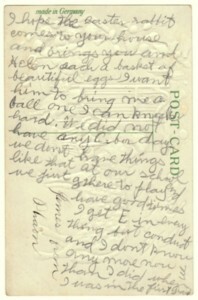 I also found a series of images on postcards he did in 1905 odd. They consisted of the usual beautiful landscaped background with people in native costume, but no head. I have never seen headless people on postcards before. A rather odd choice to paint, don’t you think? If you would like to see these odd postcards for yourself, go to http://www.heimatsammlung.de/motiv_unter/mailick/mailick.htm. The page is in German, so you may need to find a page translator. 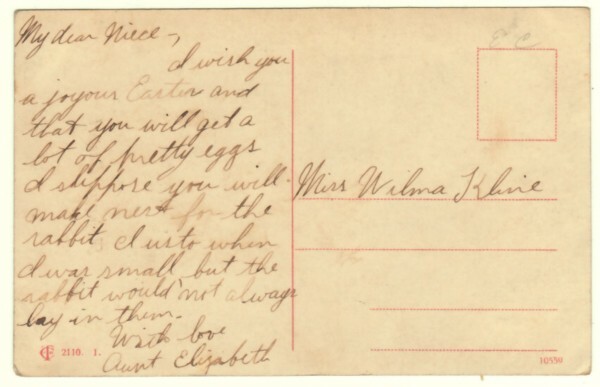 ** The above undivided backed postcard is a 1903 green Santa Claus with donkey signed by Alfred Mailick. It is from my personal collection and not for sale, sorry. You can find other beautiful Santa Claus postcards in my store, Remember When Vintage Postcards. I have fond memories of visiting the St. Paul Winter Carnival Ice Palace, the internationally recognized icon of this festival. My dad would take me and my sisters every year one was built. I was therefore delighted to come across a real photo postcard of the 1941 Ice Palace. The first ice palace was built in 1886, the year the festival began. Blocks of ice for a palace, each weighing approximately 500 pounds, came from Minnesota lakes (many times from Lake Phalen). The 1941 palace was made of 30,000 blocks of ice; the 2004 from 27,000. Wow, no wonder an ice palace wasn’t built every year. That’s one heck of allot of ice (not to mention the amount of melted water later on). Visitors weren’t allowed to walk thru ice palaces after 1941 until the 2004 ice palace due to liability concerns (insurance was hard to obtain and quite costly). That always disappointed me when I visited the castles. I wanted to explore and imagine life in them. The illuminated 2004 ice palace also included an ice rink, last a part of the 1938 ice palace. The illumination of palaces in changing colors wasn’t a new idea. The ice palaces from 1937 to 1947 were also illuminated. A photo gallery of past ice palaces, many of whom are postcards, can be found on the Minnesota Historical Society‘s web site. They are each awesome works of architecture. Enjoy viewing!